DocumentContainer contains DocumentTabStrips (containers of DocumentWindows). Each RadDock has only one DocumentContainer and this container cannot be deleted by design. By default, the DocumentContainer is visible even if you do not have any documents opened. This behavior is similar to the Visual Studio behavior. RadSplitContainer corresponds to Microsoft’s SplitContainer, but it offers not just two, but a list of Panels. Actually, RadDock inherits RadSplitContainer thus inheriting all the logic of displaying split windows. RadSplitContainer uses RadSplitter which allows you to resize your dock containers by drag and drop operations. RadSplitContainer is also available as a separate control. ToolTabStrip is a control that displays the tabs to switch to different tool windows docked in the same container. ToolWindow, as you probably have guessed, is the actual container for all the controls you wish to add and drag around. DocumentTabStrip is a control that displays the tabs to switch to different document windows docked in the same container. DocumentTabStrip hosts DocumentWindows which from their side can host your controls. DocumentWindows are tabbed documents that cannot be dragged outside of their container. DocumentWindows can be dragged and repositioned within their container. ToolWindows are tool window style panels that can be undocked and dragged off the form or to other docking containers. ToolWindows can be pinned open or unpinned and auto-hidden (i.e. collapsed against the nearest side of the RadDock). 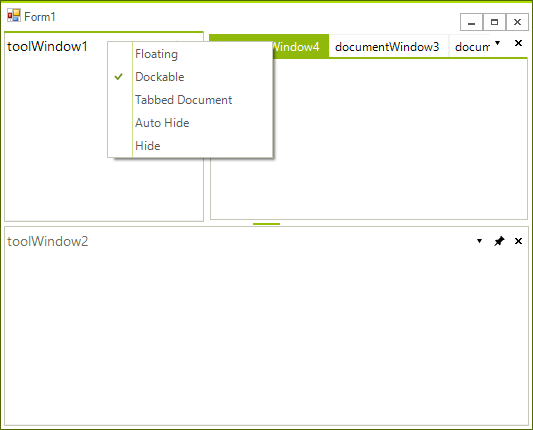 ToolWindow can be dragged onto DocumentWindow containers as well, but it retains its identity as a ToolWindow so it can be docked back in ToolWindow containers by its context menu (Dockable option)." HostWindows host your UserControls and when you dock a HostWindow in RadDock, it is interpreted as a ToolWindow. Auto-HideTabStrips are shown at the edges of RadDock when you have an Auto-Hide windows. RadSplitters are shown between dock containers (ToolTabStrips, DocumentTabStrips) to allow you to resize these containers. 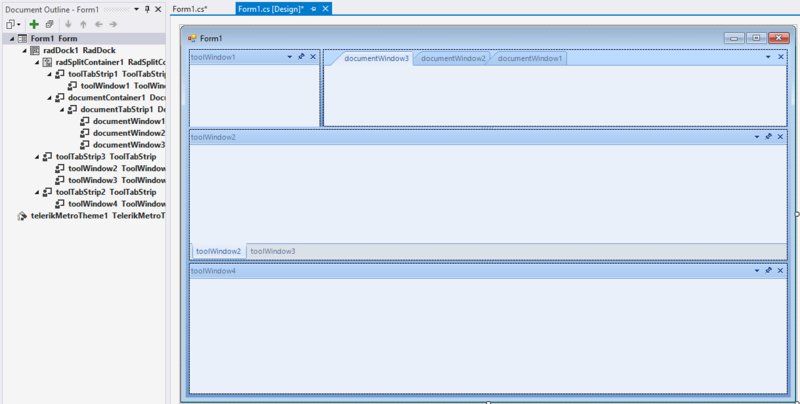 Both, ToolWindow and DocumentWindow host other controls and provide two different approaches to managing layout. 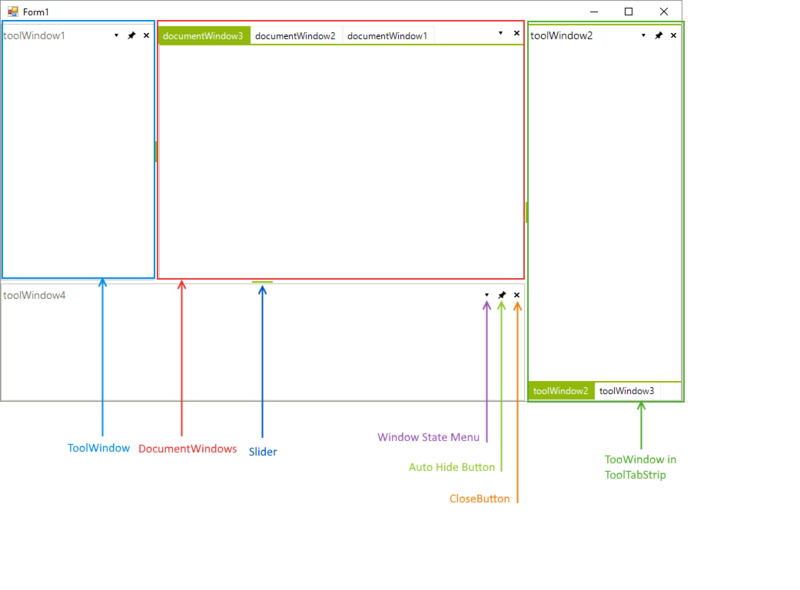 Figure 2: The document outline window in Visual Studio. Differences in the behavior of DocumentWindow vs. ToolWindow are reflected in their context menus. 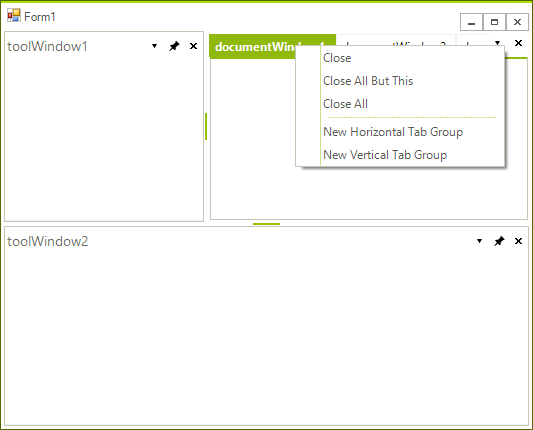 DocumentWindow has commands for closing windows, creating new horizontal and vertical tab groups and for moving windows between groups. The ToolWindow context menu has commands that allow the panel to be Floating away from the form, Dockable (causes the panel to dock) or Tabbed Document. If a Tabbed Document is selected the ToolWindow becomes hosted in a DocumentTabStrip container along with the tabbed documents. Auto Hide causes the panel to be unpinned and collapsed against the nearest edge of RadDock (see the diagram in "Structure of RadDock" above). Hide makes the panel invisible. By default, hidden ToolWindows are still part of the RadDock ToolWindows collection.